I Won't Be Canoeing Around These Parts! 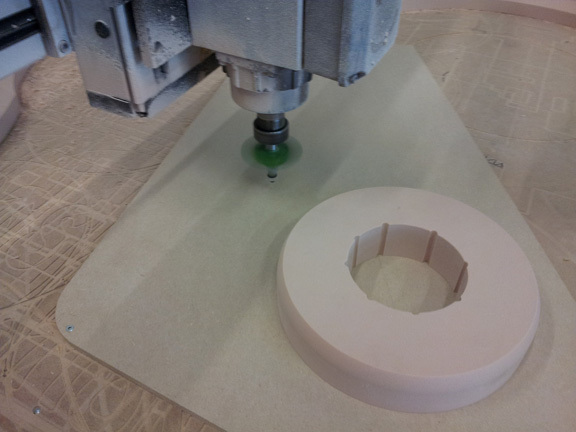 As I had already machined the back of the neck, I had to come up with a solution. 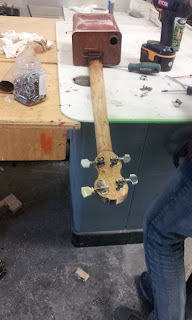 The solution was to mill off the bump-out for the 5th string, and make the neck without it. DOH! Jamie stoooopid! 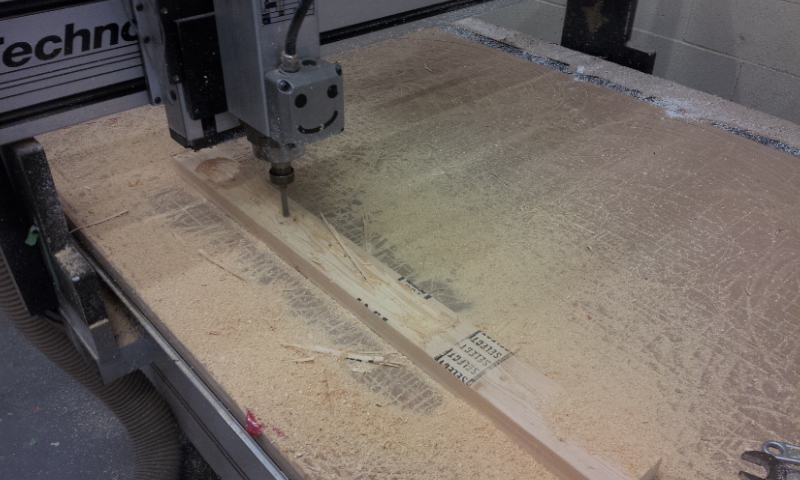 The neck was 2 sided machined from a 40" piece of a fairly straight 2X4. A little dry, but did the trick. 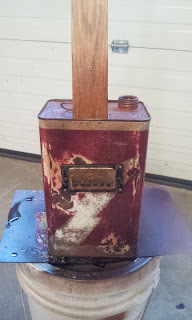 Once the neck was cut, I traced it onto the top of our brand new-old rusty can, and cut the opening with a dremmel and a cut off wheel. The neck slid through the body and got screwed to the can at the back. I drilled out the 4 holes for the now tarnished tuning pegs, and screwed them down. I used a nail, bent accordingly, for the nut. I cut in 4 grooves so the strings would ride evenly on the way to the tuning pegs. 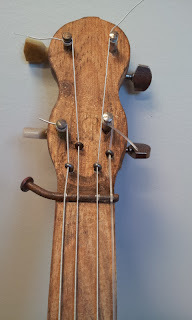 In order to keep the strings seated in the nail, I drilled the headstock and hooked the strings with some rusty cotter pins, bent over on the back side. We used a detail sander with a scratchy cloth to sand through the paint layers, down to the metal in spots. This got sprayed again with a rust accelerator, to age the now exposed metal. The final detail was a clothes pin for the bridge. No need to actually fasten it down, as the tension on the strings held it firmly in place! 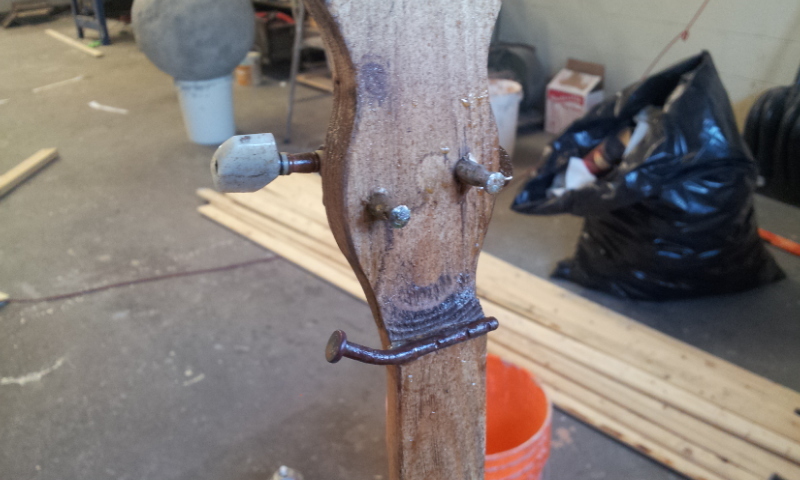 I drilled the neck for the 5th string tuner, and used a bass tuning peg. Total red-neck! The job delivered today at 2:30, and they loved it! 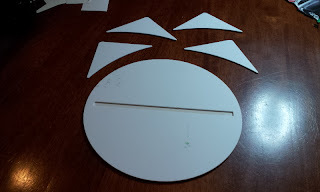 I've 2 small jobs to finish up tomorrow before we head down to Indiana, and I hope to blog about the sign camp while were there, but I think the internet is a bit slow, so it might be when we return before I post about it! 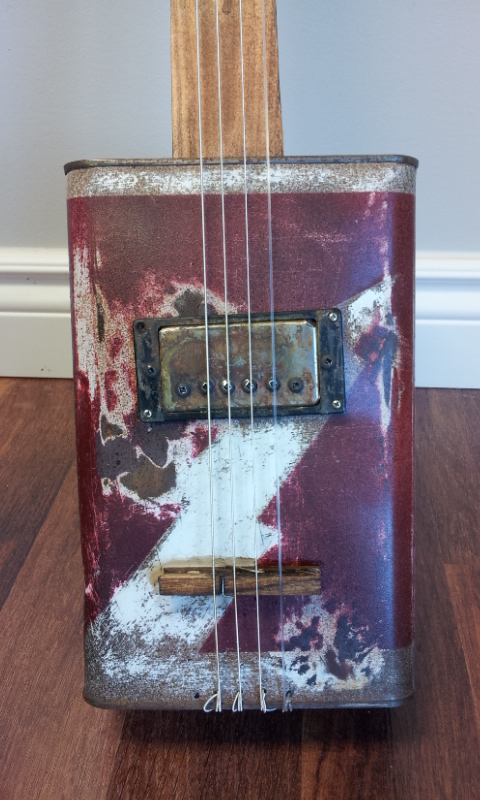 Back Woods Gas Can Banjo! I got a call this afternoon from our awesome art direcor friend Alan Fellows, He's the guy who got us the Fisher Price miniature builds. His next commercial needs a "Gas Can Banjo" A google image search turns up all kinds of neat examples. This is supposed to look like it's celebrating Hill Billy Ingenuity! The best part is I had the perfect can in the shop, almost empty of lighter fluid! I poured a little sulfuric acid onto the top and let it sit for a while. 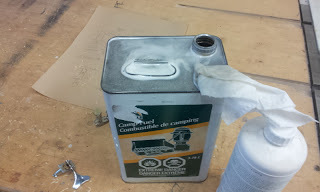 This was to strip off any tin coating that would be on there to stop the can from rusting. While it was doing it's thing, Jody and I headed down to the music store I used to pretty much live at in my rock and roll days. 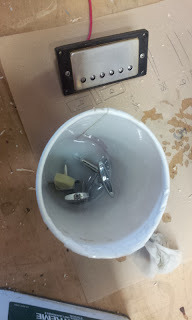 And thanks to John Bradley, the greatest guitar tech ever, we were able to scavenge some tuning pegs and an old guitar pickup. Score! I threw the heads into some acid for an overnight bath. Not sure exactly what they'll look like in the morning, but it's got to be better than bright chrome! I also scuffed most of the gold plating off the pickup. 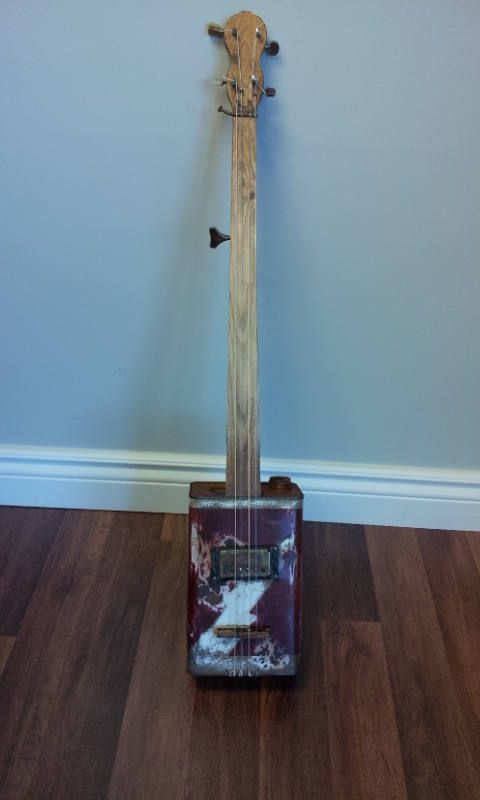 This banjo need to look well used. 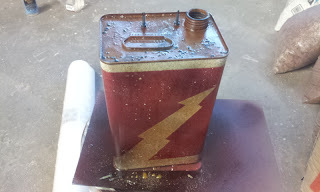 The reference image showed a gas can that was red with a white lightning bolt that had the word GASOLINE written in it. They don't want the can to actually say anything, so I didn't put any text on it. I masked the can, and cut a quick lightning bolt out, then lightly sprayed it with a flat red color. 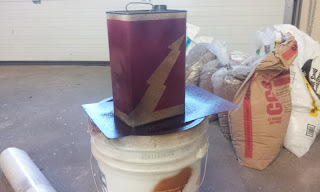 Once the red was dry, and the masking removed, I lightly hit it with some black and brown paint as well. This will get worn down tomorrow when it's good and dry. 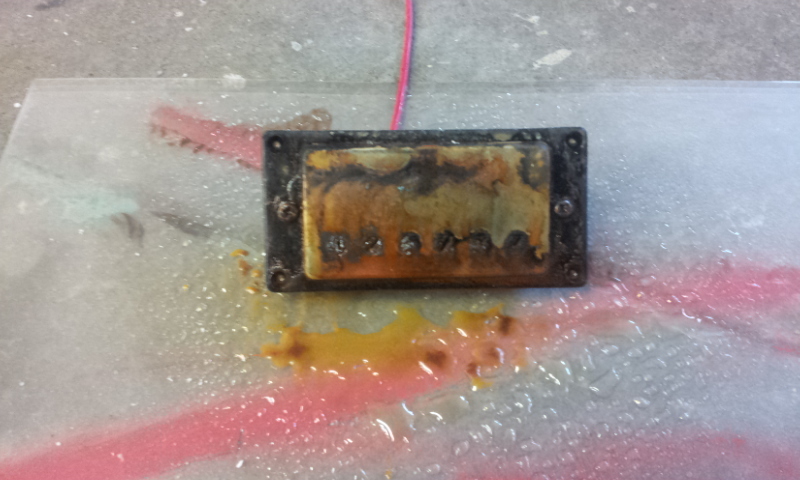 With the tinning removed from the top and bottom, I sprayed it with a rust accelerator, for the instant rust. I also sprinkled some iron powder on the surface for some added texture-ish spots. The guitar pick-up also got the same treatment. It's pretty heavy right now, but I'll take it back a bit tomorrow. 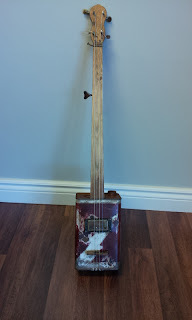 Luckily the banjo only has to LOOK like it might actually play, as the deadline is Monday at noon, pretend works well for me! 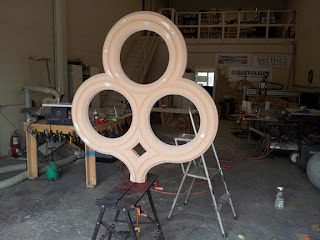 Jody and I will be in Indiana next week for Robert Jones' sign seminar. We were asked to teach again this year, but we had a schedule conflict, that actually turned out NOT to be a conflict after all. So we will be going down anyway, to see some friends, and make a few more! I'm pretty excited to get to go back down there, the hospitality from Robert and his wife Deb is top notch! It will be good to see them again. 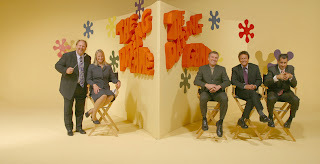 Mike asked us to replicate the 70's show "The Dating Game" logo. I don't exactly know if it's going to be a series or not, but it doesn't matter cause I'm a building machine! Very straight forward indeed. 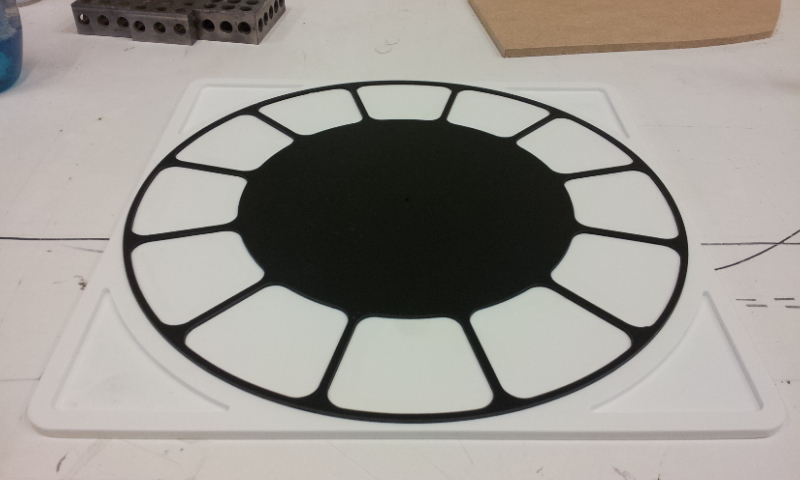 They sent a black and white image of the logo, which I was able to quickly vectorise and toolpath in Aspire. 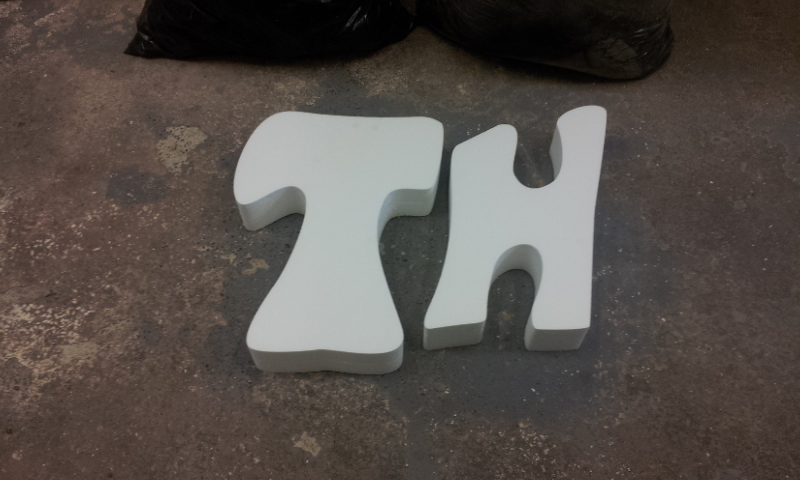 The original logo is split thickness, "the" and "game" were cut from 4" styrofoam, and "dating" was cut from 2" foam. 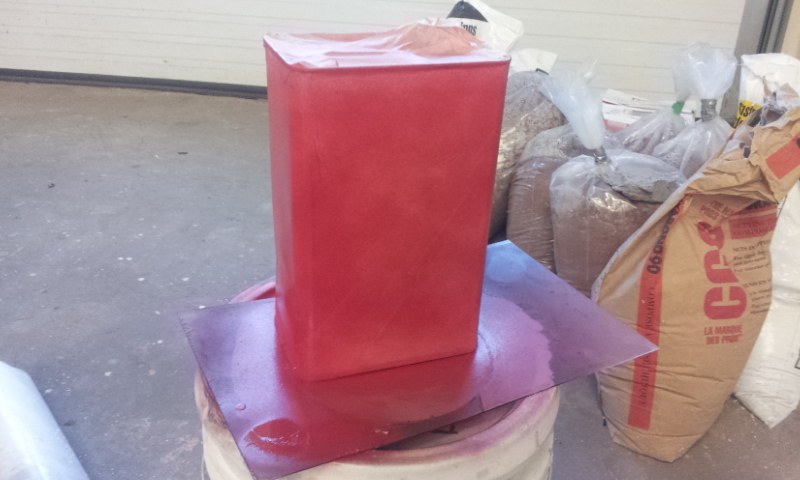 Finally, we got 2 coats of latex, in awesome 70's orange applied, and let them dry! Mike's coming around noon tomorrow to pick them up, so that saves us a trip to the studio tomorrow! These kind of jobs are the best, quick turn around, with no 'back and forth' design overhauls! I guess you get what you ask for! After re-reading my last post, I noticed that I said I wanted to work on something a little smaller than the giant key! 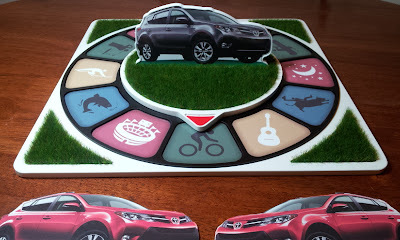 Our latest build is quite a bit smaller at 12" X 12"
It's a generic game board for a Toyota commercial. I got the inquiry Saturday, for delivery to set on Wednesday for pre-light. So Monday was spent doing all the drawings, sending them off, changing everything, sending them off, etc, etc, etc! The graphics were the biggest debate, but by 5:00 today they were all signed off on. Even though the graphics were up in the air, the layout of the game was already finalized, so I could get started this morning. 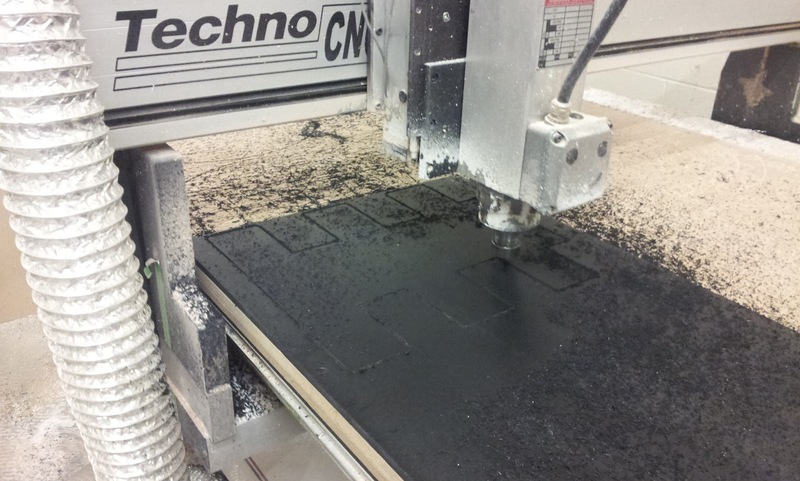 The main game-board was pocket milled on our small Techno cnc. I originally was going to use .060" black styrene, and glue it to the face of the board. But that ended early as I didn't actually have any 060 black! 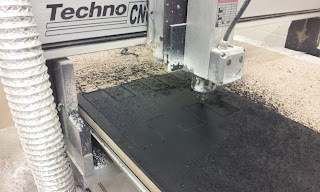 So I decided to pocket mill the frame for the icons into the base plate, then use 1/8" black pvc, this would look the same in the end, but the pocket milling made sure the frame got glued up in the exact right spot. I also pocket milled the corners of the board as well. These will eventually get grass pads snapped in, and after the Fisher-Price miniatures we did, we got tons of miniature grass at the shop! The actual disk that spins was 7" in diameter, and was pocket milled for the upright that will hold the car image, as well as the round grass pad. The arrow tip also got pocketed, for a recessed red arrow tip. They wanted a raised frame around the image of the car on the upright portion. 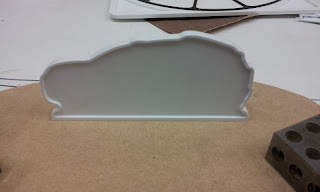 There are a bunch of ways to tackle this, but I opted for mirrored frames glued to each side of a 1/8" matching cutout. 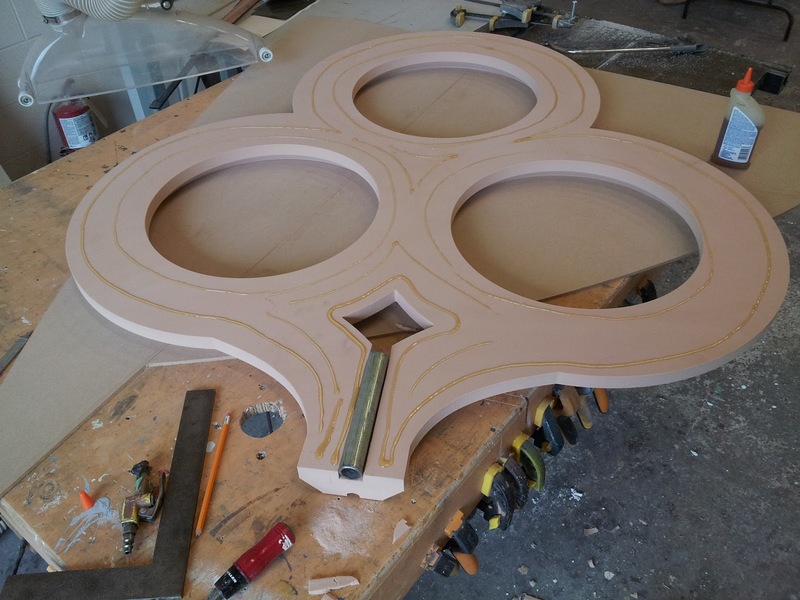 The edges of glued up styrene can look a little crappy, so when I drew the file, I allowed extra material to be routed of with a 1/4" bearing flush cutter. 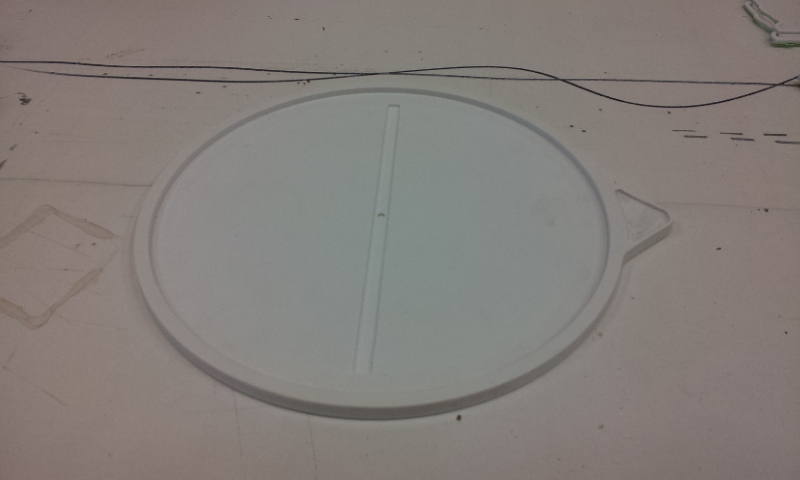 I made a jig that was the "actual" size, and taped it to the part, then cleaned it up with the router. 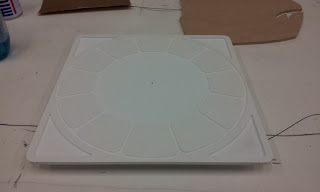 A little hard to see, but cleaned up really well with the flush cutter. I cut all the grass pad backing plates from .060" styrene. 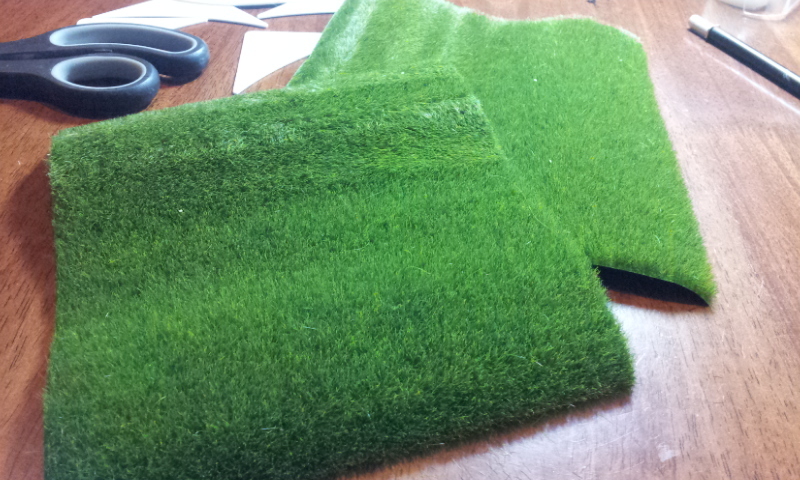 These will get the grass glued to them, so I can trim the grass easily, and just drop them in with some glue. At this point, the graphics were all approved, so I was able to get them on the game board. They look pretty good! 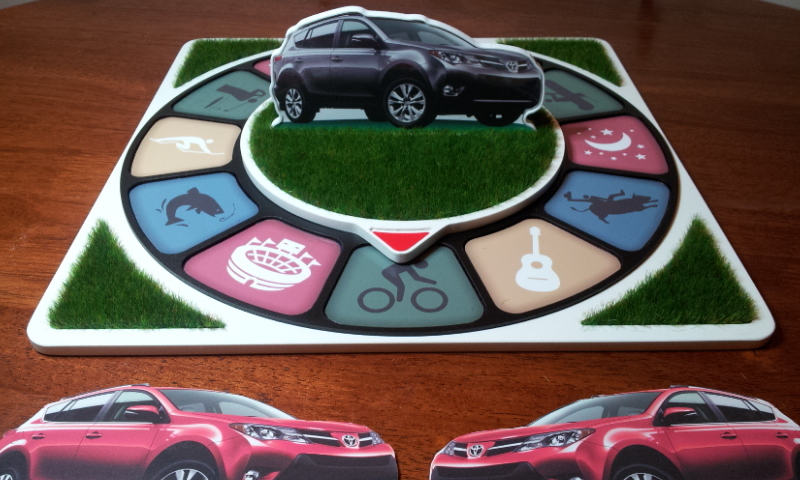 Because the image of the car on the game is a 3/4 perspective shot, it makes dealing with the tires on flat ground very difficult. They're all at different heights. 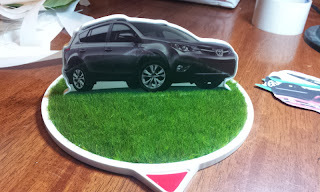 So I chose a pretty deep pile grass mat in hopes to hide where the tires ended a little bit. 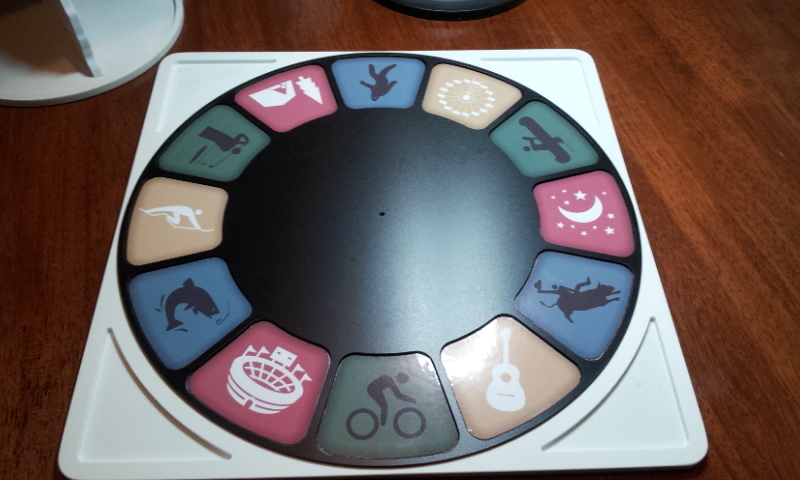 The spinner looks great with the grass put down. Or should I say "grown" Plus the deep pile grass solved the tire problems. The final game looks great! They haven't decided on a final color for the car, so we printed off all 3 options, and they'll apply the final choice on the day! This was a pretty sweet break from the last 2 jobs. It's nice to sit at a table and build for a change! I need a bigger keychain! Today we got the paint on all the pieces of the key job. 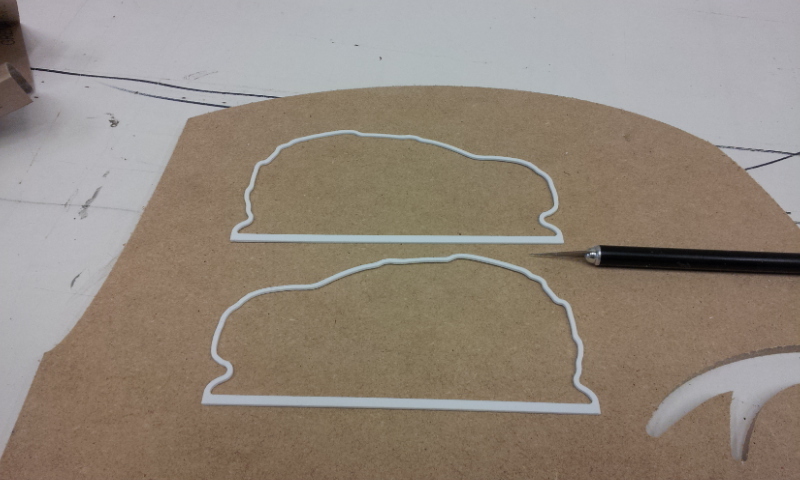 I can't discuss the other parts of the build, so we're just documenting the key portion. 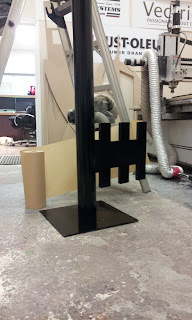 The blade of the key got cut from 2 layers of 1/2" black pvc. 16" X 18" is a pretty big key blade for sure! All of these parts were drawn and toolpathed right in Aspire 4. It's awesome when you can keep the computer part all in one program! We painted the shaft and transition rings separately, then assembled them when they dried. This got painted it's finish coat with Rustoleum gloss black laquer, so the dry time was pretty sweet. after about 20 minutes, we were able to start the assembly of the blade to the shaft. The blade was attached with screws from the inside of the tube. A little tight, but I won in the end! It was a little awkward getting the key top into position, but with the collar fitting over the tube, the fit was perfect. This will get secured with a couple of screws to pin the handle to the shaft. 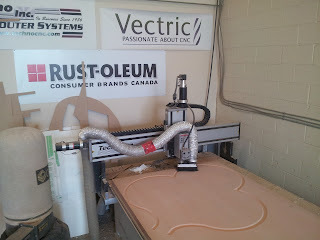 By the end of the day, we had everything finished and ready for the install tomorrow. 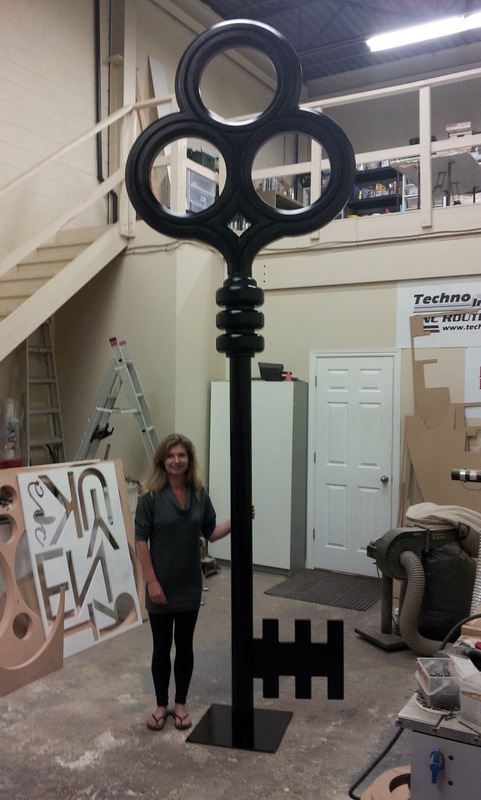 Little Jody is completely dwarfed by that colossal key! A short deadline, but a fun job. Although I really feel like working on something small for a change! 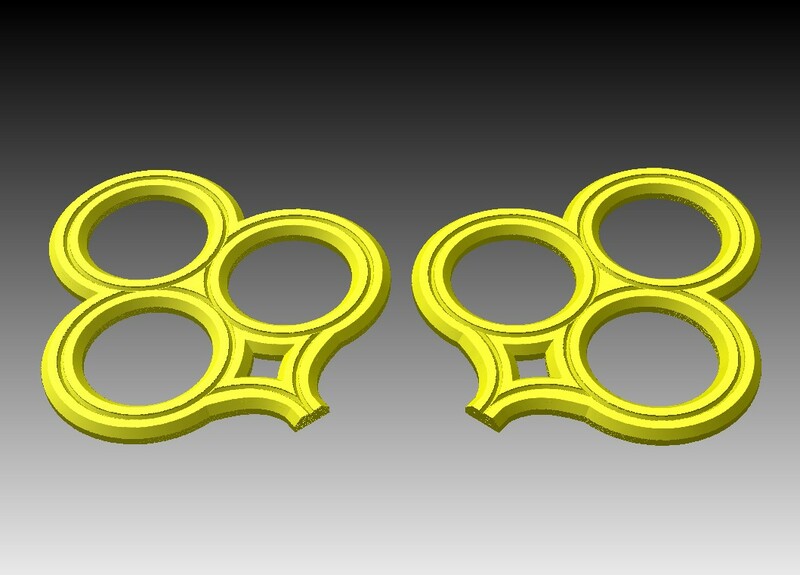 The Hardware store won't be duplicating this key! 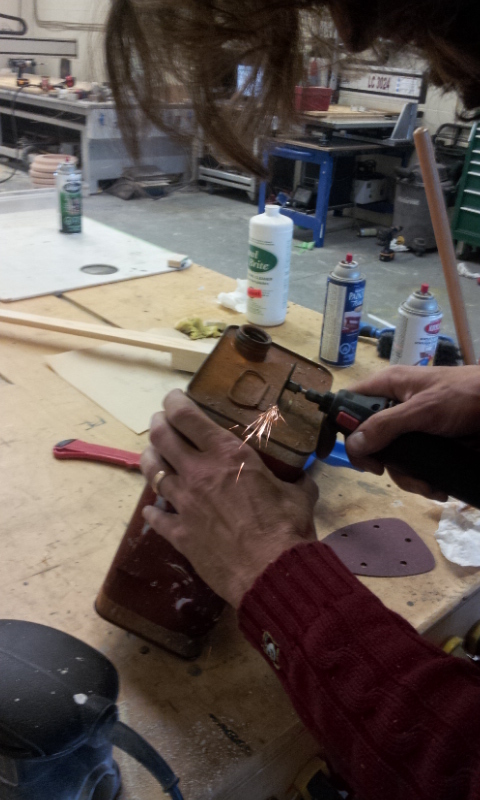 Today I got started on the transition piece that blends the key handle to the shaft. This is a series of HDU rings that will be all glued up. The smaller rings needed only to be 1" thick, so I profile cut them on the Techno cnc from a 2" piece. Then I simply set the table saw fence to 1" and split them in half. 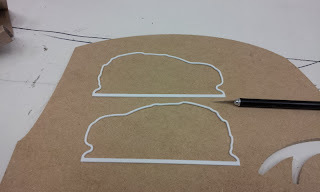 I also filed some channels into them for gluing. I could have toolpathed this right into the file, but I wasn't thinking that far ahead yet! 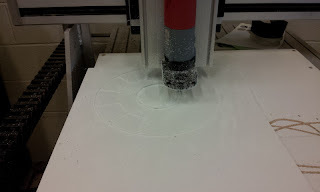 I've got a huge 1.25" radius round over bit, and I wanted to use it on the rings. But due to the fact that it's a bearing cutter, I used the Techno like an overhead router and spun them manually. A little freaky with the cutter spinning at 8000 rpm! 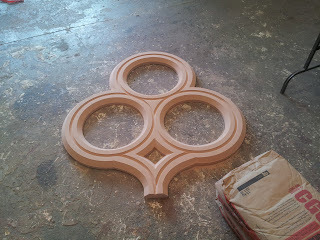 With the sections all put together, this is what the transition piece will look like. 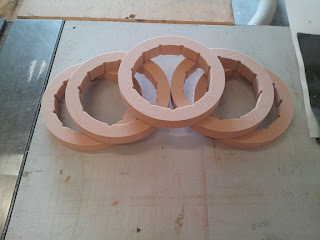 I stacked 2 rings together for the larger ones, for a total of 4". Pretty big stuff. 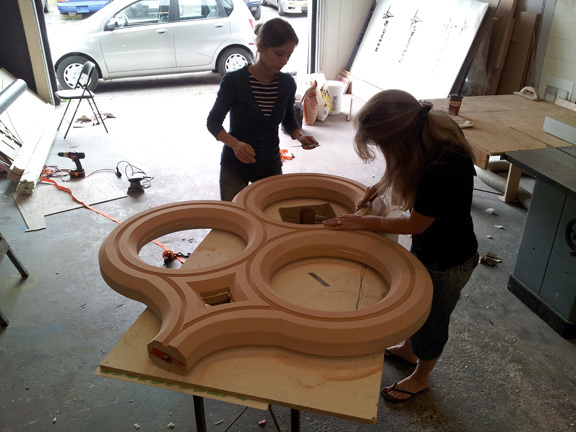 Jody and Anna worked on cleaning up the handle a little before paint, while I cut some pieces for another NDA job. 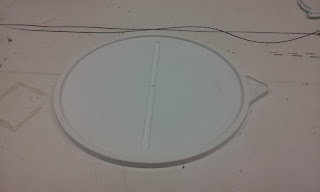 With the glue seams taken care of, and a little filler here and there, it was ready for paint. I really like using the 1 part epoxy garage floor paint as an HDU primer. 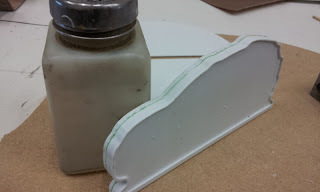 It fills the pin holes pretty good, is waterbased, and unlike latex, you can sand it when it dries. 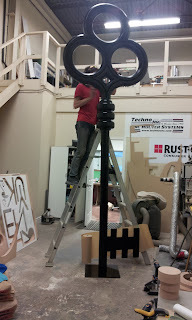 We wont be doing this key with an automotive finish, but it's still going to be glossy. The shaft of the key got cut to the right size, and sanded for paint as well. Although by 5 o'clock, I really wanted to use it as a golf club against that pesky Fisher-Price moon that keeps getting in the way. Stupid moon. Maybe I'll get to hang it tomorrow before I line drive it down the street! Got a big lock that needs opening? Our newest build is a giant skeleton key. I have no idea where it's going, or for what it's for, but I don't need to know. I just wanna build! I do know that it's not going outside, so that makes material choices easy. 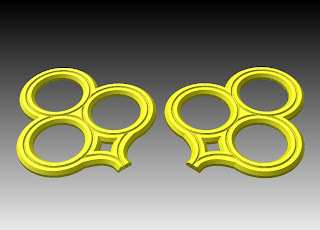 I drew the vector files of the handle in Aspire, and mirrored them for the back side. Even though the front and the back are the same, I find it safer to mirror than copy. Just in case something moves a tiny bit, they'll still line up. 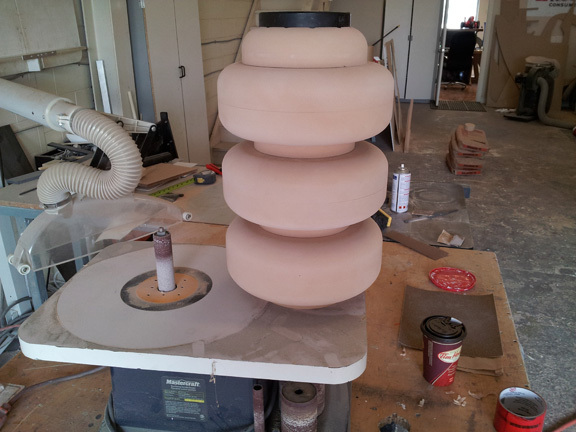 I never wanted to 3d machine this part, largely due to the deadline, and mostly due to hand sanding after. So the obvious choice was using the v-carve horsepower of Aspire 4. I only had a 3/4" 90 degree v-bit in the shop, so I had to toolpath with that. All in all, it took an hour to v-carve, v-profile, and cut out on the Techno. 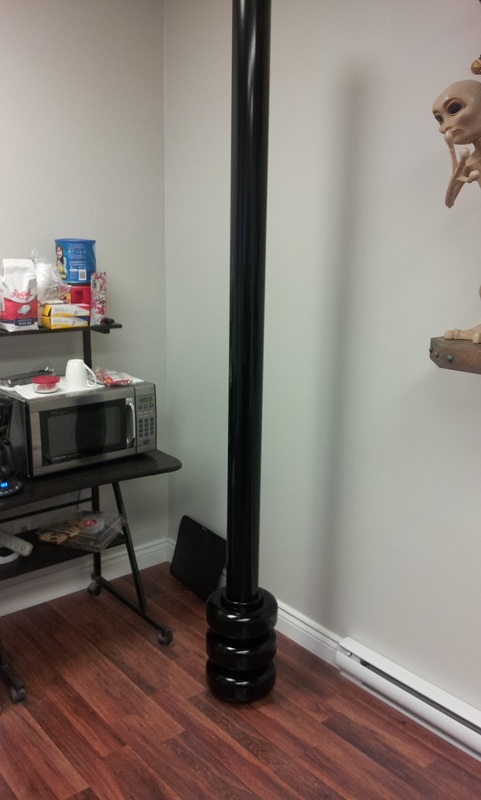 This handle is quite large at 47" wide. Aspire's V-carve engine is really fluid, and you can definitely see it in the motion of the machine. 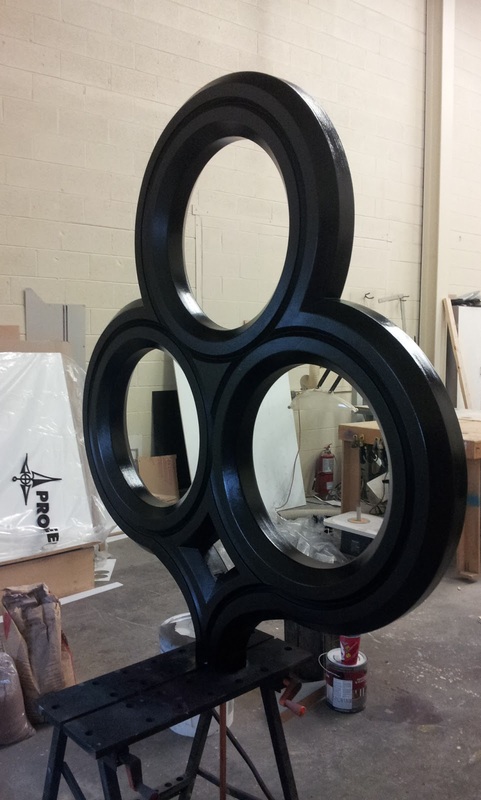 HDU was the material of choice for this. 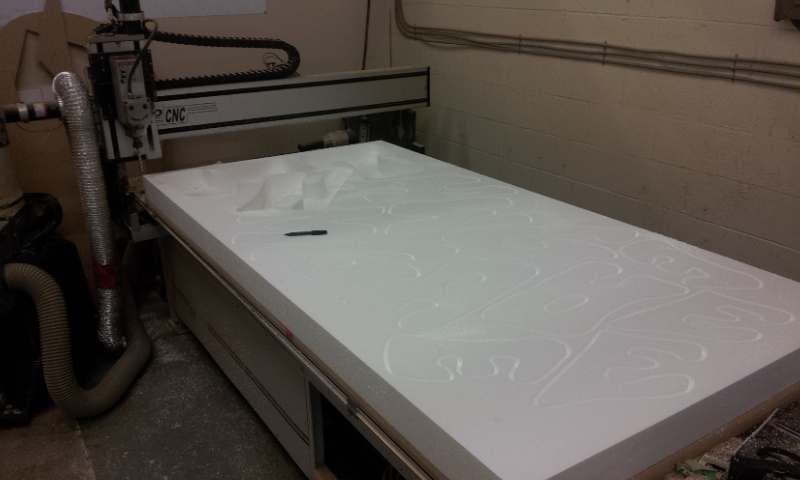 A little overkill, but lighter than MDF, And there isn't the labor associated with hard-coating styrofoam. It looked great right of the Techno! I hogged out a channel in the stem of the handle for a piece of 3/4" iron pipe. 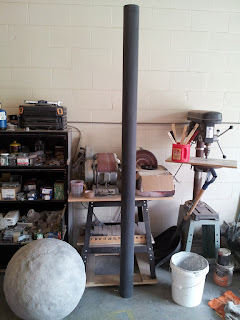 I'll run a threaded rod down this pipe to clamp it to the cap that will mount on the pipe we're using for the key shaft. 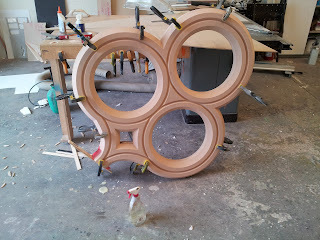 I wish I had about twice as many clamps as I do, but they seem to be doing the job well enough! Tomorrow we'll get started on cleaning the handle up, and finishing the rest of it! Thankfully the weekend is over!